Clinton, Michigan - Eden Organic 100% Whole Grain Udon Pasta was selected by Women's Health magazine in the "125 Best Packaged Foods for Women" annual feature of the November 2010 issue. 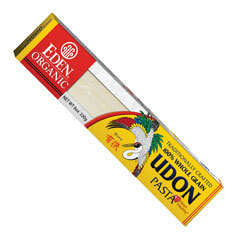 Eden 100% Whole Grain Udon Pasta was the top choice in "Pasta & Rice". Women's Health said, "With 15 percent of your daily dose of iron, zinc, and niacin, plus 20 percent of your day's thiamin, phosphorus, and magnesium, Eden's Japanese noodle puts others to shame." Women's Health said, "No need to fear these carbs." In making selections the healthful qualities of each product were rated. Eden 100% Whole Grain Udon Noodles received the highest rating of all items in all categories. Women's Health wrote of their best food list, "The average supermarket carries 46,852 items. To save you time (and keep you from lapsing into a nutrition-label-reading coma) our team of experts plowed through the aisles and found the ultimate good-for-you items for staying slim, fighting disease, and enjoying every morsel you put into your mouth." The "125 Best Packaged Foods for Women" list is a convenient and helpful guide to assist women in making quicker, healthier prepackaged food purchases. Made of Eden milled North American family farm organic durum wheat, Eden Organic 100% Whole Grain Udon Pasta is the first and only 100% whole grain udon noodle. It is crafted with a bit of Eden Sea Salt at Eden's Sobaya Company in Montréal, North America's only certified organic, traditional Japanese pasta making plant. Eden Organic 100% Whole Grain Udon Pasta is low fat, low sodium, rich in fiber, thiamin B1, phosphorus, and magnesium, and a good source of protein, iron, niacin B3, and zinc. Eden Organic 100% Whole Grain Udon Pasta is delicious with traditional 'dashi' - kombu/shoyu soy sauce broth, in stir fries, salads, and soups, or with a favorite sauce. No refined flour, refined salt, eggs, additives, preservatives, or shortcuts are used in making these exceptional noodles. Packed in reclosable boxes made of recycled paper, the most environmentally friendly, recyclable packages we could muster. kosher.